When Beatrix Potter was presented with a copy of Alice’s Adventures in Wonderland as a child, she was immediately ‘absorbed with Tenniel’s illustrations’. Before publishing her own stories, Potter illustrated fairy tales and classic texts, including Alice’s Adventures in Wonderland, to amuse herself and to develop her technique. In the 1890s her pet rabbit, Peter Piper, became the model for Potter’s own illustrations of the White Rabbit. 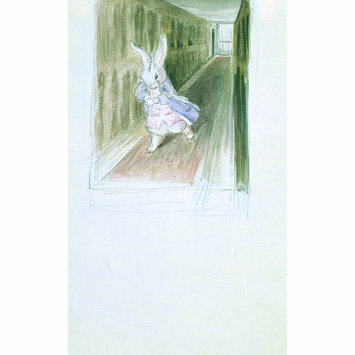 A watercolour over pencil illustration of a white rabbit in a blue coat running along a long wood-panelled corridor, pulling on his white gloves as he runs. The illustration sits within a rough pencil border. Mounted with a related illustration (object number BP.455(b)). Drawn by Beatrix Potter in ca. 1895. Acquired by the V&A from Leslie Linder (1904-1973) in 1973 as part of the Linder Bequest, a collection of ca. 2150 watercolours, drawings, literary manuscripts, correspondence, books, photographs, and other memorabilia associated with Beatrix Potter and her family. 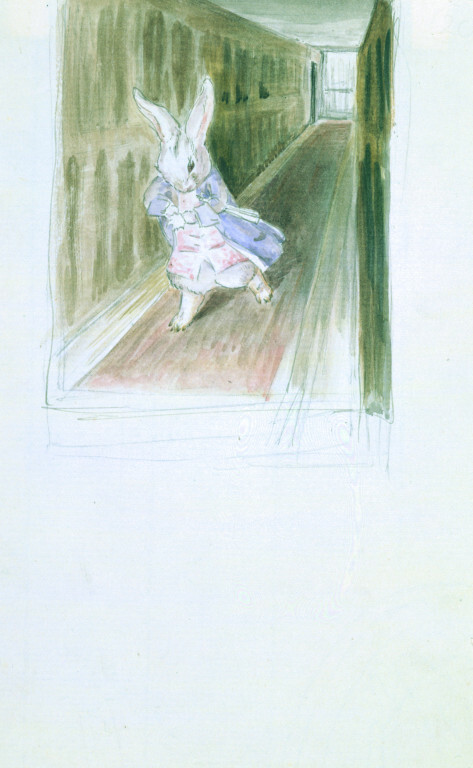 Watercolour and pencil drawing of the White Rabbit running along a corridor, an illustration to Lewis Caroll's Alice's Adventures in Wonderland drawn by Beatrix Potter, ca.1895; Linder Bequest cat. no. LB.972.